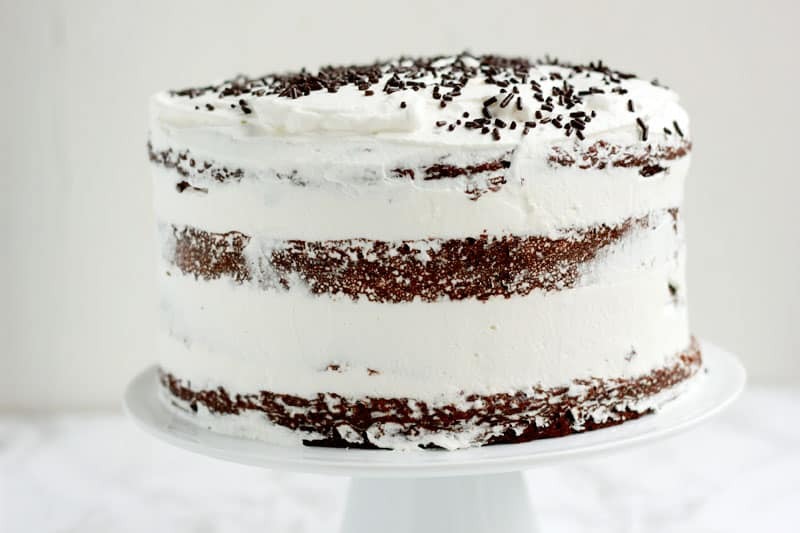 This chocolate whipped cream cake is the perfect way to celebrate any occasion. 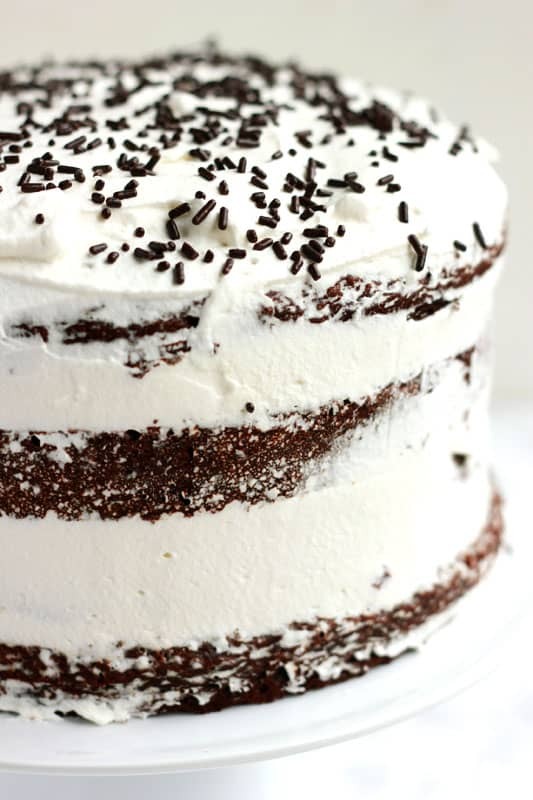 Light chocolate cake is layered between a sweet whipped cream for the perfect cake recipe. My grandma used to make this cake for us for birthdays. There were two versions… chocolate and vanilla. Most of us chose the chocolate. The only time I remember ever having the vanilla version was Easter. She would color the whipped cream into pretty pastels which paired nicely with the warm color of the yellow cake. The secret is to serve it COLD. Make it a day in advance and store it in the refrigerator. The flavors blend together beautifully leaving you with the perfect cake. My grandma always used a cake mix. I decided it was time to upgrade to a homemade devils food and am so glad I did. The cake itself is the closest thing to perfection that you can get. Moist, chocolaty, and perfect topped with your favorite frosting. While my cake may have changed, my whipped cream is still the same I made in my grandma’s kitchen as a kid. It all starts with a carton of heavy whipping cream and a chilled bowl. I do recommend using a mixer for this part just because stirring by hand takes some serious muscle. You want stiff peaks to form giving you a good base to hold your cake layers in place. By chilling the bowl (and even the whisk attachment) you cut down your mixing time significantly but it isn’t necessary. Just consider that my helpful kitchen trick to you. Place your mixing bowl and whisk attachments in the freezer for 10-15 minutes or until chilled. Pour in cold whipping cream. Whisk until slightly thickening. Add vanilla extract and powdered sugar. Continue to whisk until stiff peaks are formed. Another beautiful thing about this recipe is that you do not have to be a super great cake decorator. You can pipe the whipped cream between layers, spoon it on, or just spread it with a knife. 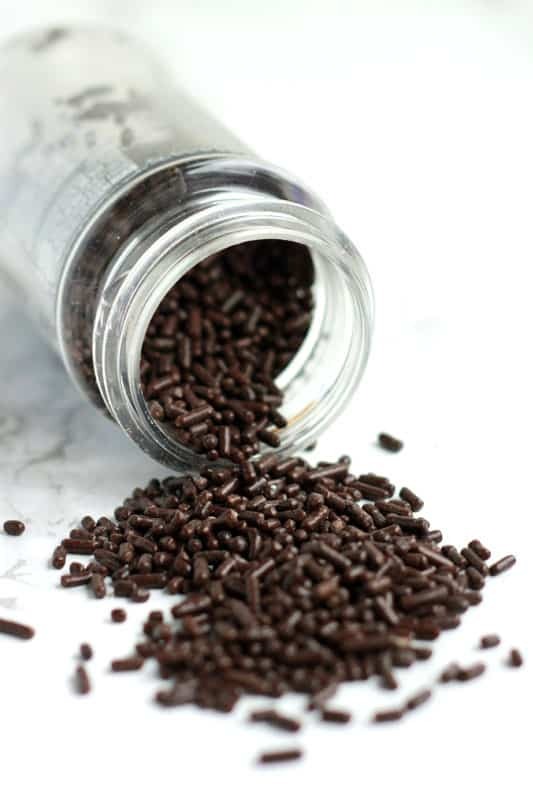 Cover the top with sprinkles and you are all set! Grease your pan with butter or cooking spray (I suggest coconut oil spray). Place 1-2 tablespoons of flour into the pan. Gently tap and rotate the pan to cover the entire thing with flour. Tap out excess. Place a round piece of parchment paper on the bottom of the pan. Pour the batter directly on top and bake. How do you store a frosted cake? Most cakes, when stored properly, and fine stored at room temperature. This cake, however, should be stored in the refrigerator. I am sure that love is the secret ingredient in this easy cake recipe. It is a family favorite of ours and I am sure you will love it as much as we do. Preheat your oven to 350 degrees. Line two cake pans with flour or 2 muffin tins with paper liners. Cream together the butter with the brown sugar. Add the eggs one at a time followed by the vanilla and melted chocolate. Whisk together the flour, cornstarch, baking soda, salt, and baking powder. Stir into the wet ingredients with the sour cream and water. Divide between your prepared pans. Bake 12-14 minutes for cupcakes, 25-30 for 8 inch cakes, or until a toothpick comes out clean. Cool completely and slice each cake in half creating two circles each. Place your mixing bowl in the freezer for 15 minutes. 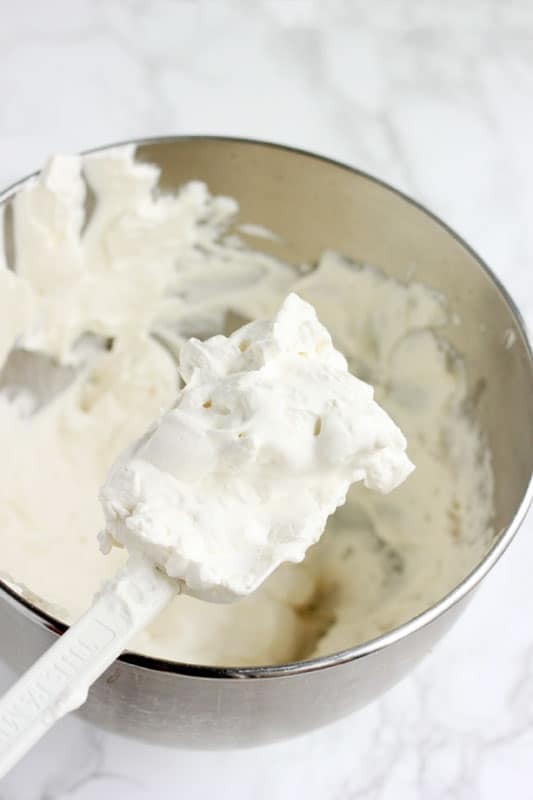 Whip the cream in the chilled bowl until soft peaks form. Add the vanilla and powdered sugar. Continue to whisk until light and fluffy. Spread between your cake layers. 1) Do I add all the ingredients for the whipped cream at once or do I do that in stages. I watched a vieo on how to create “soft peak” whipped cream and she was adding sugar in stages and adding lemon etc. 2) Your cake looks like it has 3 cake layers but your recipe says divide the cake mixture into two pans, cook, then slice in half, creating two circles each….that would make 4 pieces of cake correct? Does the picture actually have 4 pieces of cake or just 3 like it seems? Are you just cutting one of the cakes in half to make 3 total pieces (1 thick middle and 2 thin pieces for top and bottom? Lastly how do you cut the cake in half properly? Thanks so much! When I made this recipe yesterday, I used a paring knife to lightly cut around the cake’s exterior. Once I’d made the mark around the cake, I used the light cuts as a guide for a serrated bread knife which finished the job fairly easily. My recommendation would be to refrigerate the cake after baking; cake cuts a lot smoother when it’s cold, rather than room temp. As for the whipped cream, I whipped the cream alone until it was nearly all fluffy, then added the vanilla and sugar and whisked it for another minute or two—the feel and taste were both perfect. Probably too late to help you, but hopefully future visitors will benefit! 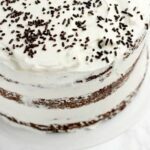 The chocolate whipped cream cake recipe does not appear in the link. Can you post it? I apologize for that! I updated the post and the recipe should appear now. Made this cake and the entire family really enjoyed it. I did let it sit in the refrigerator as suggested and it truly does add to the flavor. I thought it would dry out the cake but it didn’t! Thank you for the recipe. I will try it with a yellow cake as well.